April showers might bring May flowers, but don't expect a lovely floral bouquet as a result of this pet's "rain". This month we're featuring Lil' Bling! Lil' Bling is one of the most opulently dressed pets to date. This is no surprise, as he comes from his larger counterparts, Blingtron 4000 and Blingtron 5000. 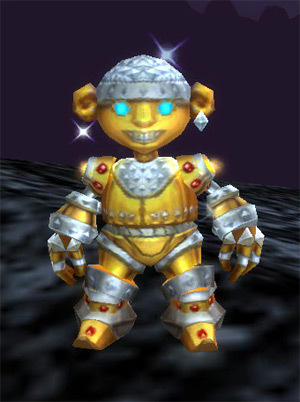 Depending on which robot you speak with, you will receive a Blingtron 4000 Gift Package or Blingtron 5000 Gift Package, and either package can contain a Lil' Bling. Players with the engineering profession can craft Blingtron 4000 after reaching a skill level of 600. The upgraded, more battle-worn version, Blingtron 5000, can be crafted by engineers at any skill level once Draenor Engineering is unlocked. If you don't have engineering, don't worry! These two robots offer an account-wide daily to all players of any level, not just to their creators. Keep in mind the dailies are mutually exclusive, so take your pick as you can only complete one quest or the other each day. The rewards from Blingtron 4000 and Blingtron 5000 vary slightly, with the latter having better item drops and slightly higher drop rates. Although the Blingtrons can be generous with their wealth, they can be finicky with their progeny. You might open a large number of packages before ever seeing a Lil' Bling. This pet can be caged though, so if you just can't wait you can always check the Auction House. Thankfully he usually doesn't cost as much gold as it looks like he's wearing! Lil' Bling's shiny exterior and name influenced a few of his moves. His first slot, SMCKTHAT.EXE, functions similarly to Batter, and will grant an extra attack if Lil' Bling acts first that round. The third slot features Make It Rain (pictured above). It works similarly to Nut Barrage, making both abilities excellent when multi-hitting moves are what you're looking for. The rest of his abilities rely on Lil' Bling's natural charisma. To complement the previous two abilities, he has Inflation, which deals small hits and applies the Shattered Defenses debuff if it connects. It functions like Swarm, only it causes a stampede of tiny Blings across the plains. Giving Bling a bit of versatility is Launch Rocket, which is primed for a turn, then is activated later for big damage. This also works really well, saved for after an Inflation. He has Extra Plating as his only pure defensive move. This shares a slot with his progenitor's signature Blingtron Gift Package. The Gift has a base 50% chance to deal damage, but it heals if it doesn't connect with his opponent. This is an ability that can be used tactically when you know Bling won't hit for a higher rate of healing. 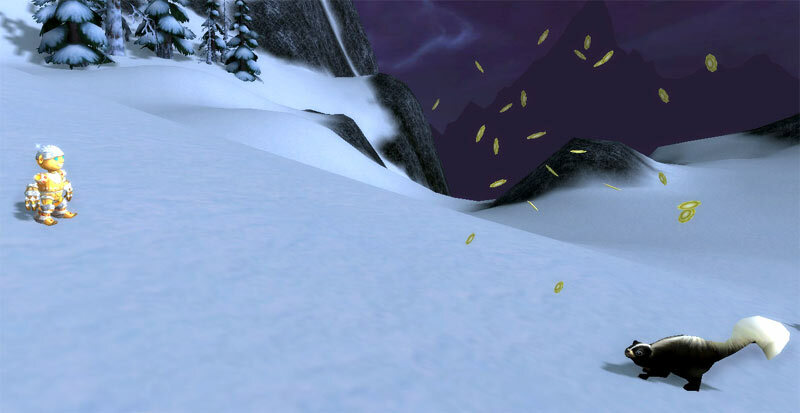 Check out our forum thread discussion on Lil' Bling and submit your own thoughts on this pet.